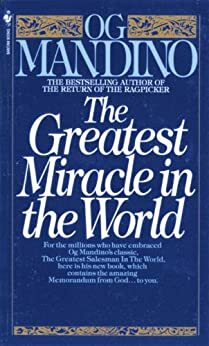 For the millions who have embraced Og Mandino's classic, The Greatest Salesman in the World, here is his new book, which contains the amazing Memorandum from God . . . to you. A great inspirational writer tells his greatest story—an amazing narrative that will hold you spellbound . . . as it reveals exciting new secrets for your personal happiness and success. Here is a simple but powerful story that will affect your thoughts and actions long after the final sentence has touched your heart. my message! She said she had misdialed and quickly hung up! She said, "you know me...I don't believe in coincidences!" We chit chatted about life. Her children are grown. She owns her own counseling business. My divorce. I hung up and thought about the book. I knew God was sending me a message to go read the book. I brought few items with me when I moved and my ex refused to give me the rest of my belongings. No way would I have that book after 13 years. I opened up a little bookcase that held mostly cookbooks and there it was...that little blue book, The Greatest Miracle in the World. I opened it up and read it. I remember why I creased the page. I remembered why I couldn't finish it. This time I finished it. This time I'm doing what the book says to do. I'm sleeping at night. I'm waking up in a better mood. I have hope. I'm searching for a new place in a new town. I'm starting to live. Buy the book. Don't crease the page. Finish it. 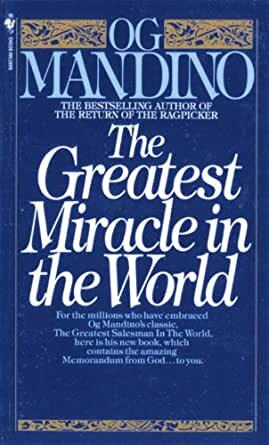 Og Mandino's book "The Greatest Miracle In The World" is one of the most inspirational books I have ever read. For those who think less of themselves than they should...they should read this book! Those who are looking for hope...should read this book! Those who want to help someone else have a better life...should send this book to those they want to help! It's the best "investment" for those in need in a mental and/or spiritual way. It is a book that you can't put down and it's book a person will always return to! This book is simply amazing. It awoke within me answers that I had been searching for. I have to admit this humbly not as a man who has it all figured out, but as a man that has realized how far he still has to go. This book helped tremendously with that and the Memorandum found within is one I believe should be shared with the world. 5.0 out of 5 starsBEST BOOK EVER!! I have read this book many times, highlighted and underlined, and decided I needed a new copy because mine is tattered from all the handling. It is truly a game changer, a life saver for many who are struggling with their thoughts and questions about their self worth. I've given it to friends and family and believe it's the best book I have ever read. I am a big fan of Og, having read 7 of his books. The Return of the Ragpicker is my second favorite!